DID YOU HAVE RUSSIAN COACH IN YOUR LIFE? "I am glad I didn't," said one of my famous clients NHL standout and Red Wings star. But after we went through training and covered all the details and precision of proper leash handling, he laughed and changed his answer. "I guess now I have had a Russian coach. And you were great!" Another client, a famous ballerina, told me: "Vladae, you remind me of one of my Russian ballet teachers. Not all the kids and parents here in the States would stay with her, but those who did became the best dancers." 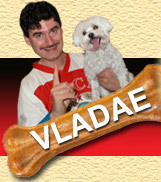 Unlike so many trainers who will tell their clients what they want to hear Vladae will tell you what you need to hear." Vladae's Training rules: If you're wrong; you are wrong. Not any practice makes perfect, only perfect practice makes perfect. Take this job onto the professional level. Professionals get the job done. You need to practice. I will check your homework. I will train you to train your dog, but I can't train your dog without you. While I will always respect your opinion, I will not agree with you if you are wrong.